Good lord, that one got out of hand in a hurry. The Houston Rockets fell to the Golden State Warriors in game 3, extending the Warriors' home playoff win streak to a best-ever 16. On the other hand, the Rockets' 41-point loss is the biggest playoff loss in franchise history. Houston's main takeaway from this game should be to forget it ever happened and to burn all records of it. Then they have no choice but to somehow take game 4. Look, you don't want stats here. James Harden was mediocre for him, and was terrible on defense. Chris Paul didn't look right, presumably related to his achilles injury the team won't admit exists. Eric Gordon was a parody of himself. Clint Capela did what he could, but was only one man. It was a marvel that the Rockets were only down 9 after the first quarter and 11 at halftime. The Warriors came out hot in the third quarter, as they always do, but the Rockets responded to push the score back to 11, but that was as far as it went. 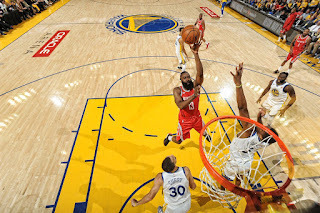 The Rockets were spent and looked utterly defeated, and the Warriors extended the lead by 20 in the fourth quarter alone. Do not, under any circumstances, watch this game. The only possible glimmer of hope is that it's generally preferable to get blown out than to lose a close one, since a blowout usually doesn't mean much. Bad games are bad games, and if the Rockets can believe that this was just an aberration, they have at least a chance in game 4. They just have to hope Steph Curry doesn't score 18 in the third quarter again, putting another stone in his gauntlet. In that case I suppose you just shoot your shot and hope for the best. Then again, that's what this whole series comes down to. More importantly, the Rockets have to deal with their long-standing habit of getting frustrated when their shot won't fall and they can't get calls. The Warriors have incredible interior defense, but Houston missed a truly incredible number of layups and dunks, all while feeling slighted by the referees. We've seen this move many times over the years, games and even season-long stretches when the Rockets seem frustrated and press, making a bad situation worse. It could not have gone any worse for the Rockets. Playing through frustration is difficult, but necessary. This game is thankfully in the past. Now the Rockets just have to shoot their shot again.